We just love beautiful spaces here on homify, especially when they replace old and worn-out areas that are in desperate need of some beautification. That is why we created our ‘before and after’ segment, to share with you not only old spaces that get reincarnated as fabulous new ones, but to inspire you to perhaps do the same with any rooms back home you may deem as “worn out” and “outdated”. Which brings us to today’s piece: a rooftop apartment with a fantastic view that had a not-so-fantastic look. 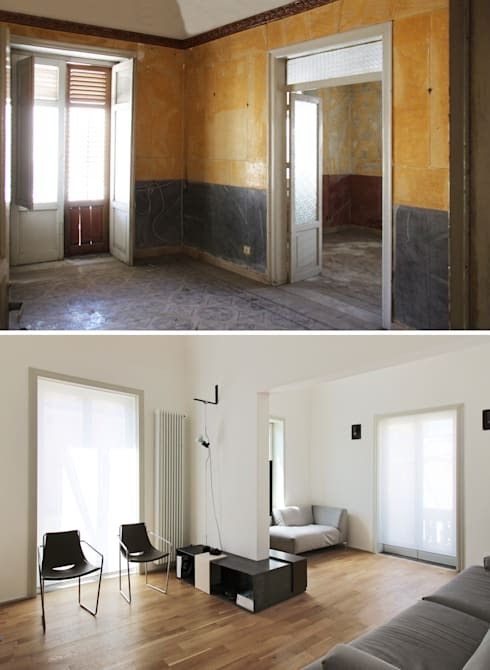 Time and neglect had definitely taken a huge toll on this once beautiful space; but fortunately some expert architects were put in charge of revitalising the apartment and turn it into a stunning and chic new living space. Since this apartment is located on the top floor of a historic building, it means a sky view – but what good does access to the sky do you if you can’t see it? That is why the experts in charge of this project opted for that generous skylight / glass ceiling to make optimum use of that open and airy view. Add to that a sleek glass dining table, Scandinavian-style chairs and crisp white colours, and we have a modern dining room that most of us can only dream about. Can you imagine what it must be like dining here during a rainstorm? A much, much better look than the starting point, which was a crumpled mess of dirt and gloom. It’s not just new colours and pretty décor pieces that were used in the renovation process; this entire apartment underwent some major structural changes, including electrical- and water amendments. So it happened that the old bathroom, which was a mess, was transformed into the new bedroom, complete with built-in shelves for a range of décor pieces from books and photos to potted plants and interesting little trinkets. And just check out that glowing sunshine streaming inside through that charming window! 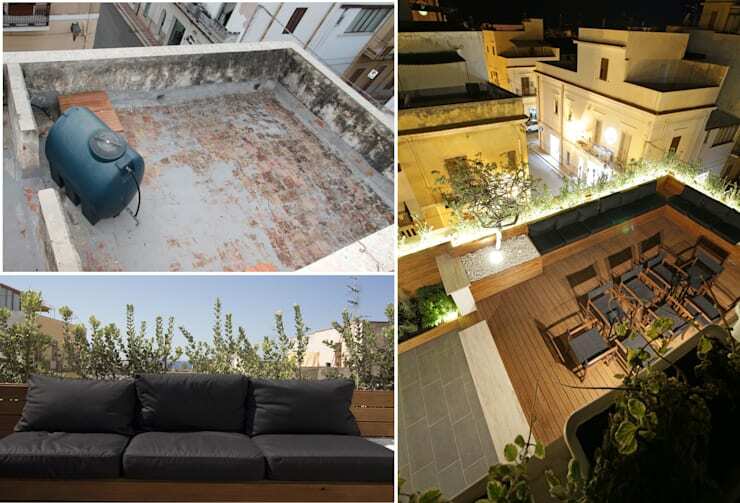 Fortunately for the new homeowners, this apartment’s roof space was so large that they were able to add an additional area to the home – and before you could say “renovation”, a sleek new terrace complete with plush seating and potted plants had become the new exterior socialising spot. Notice how fabulous those lighting fixtures glow up the entire space without adding too much glare. 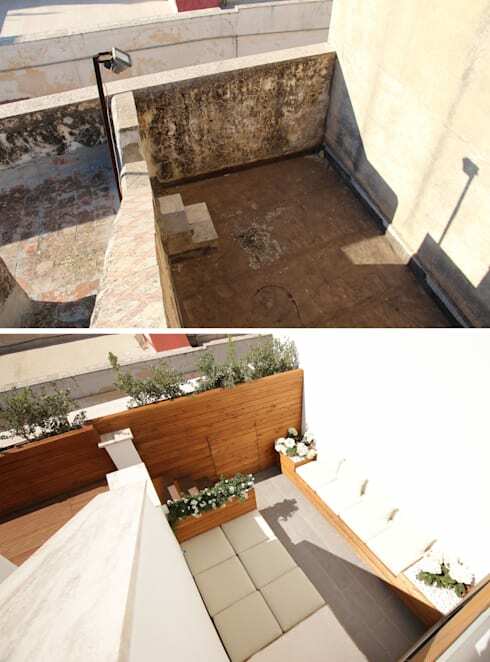 Our architects took full advantage of the fact that this apartment had access to an abundance of roof space. So, in addition to a new living-area terrace, a mini garden was also created, complete with another set of plush seating options (but this time in crisp white). Comparing the ‘before’ and ‘after’ images of the living room, it’s almost impossible to believe that this is actually the same space. In addition to tearing down a wall to ensure more legroom, a fabulous new paintjob was opted for (bye orange and grey tiles, hello sleek white). More contemporary windows were also brought in to ensure a strong modern style. And, perhaps our favourite addition, hardwood flooring, which brings in a delectable chocolate tone which contrasts so perfectly with the light neutrals of the furniture. 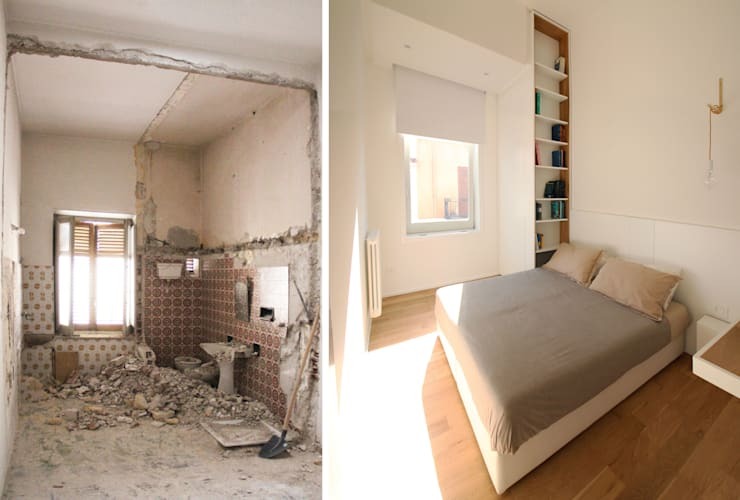 Now this is a prime example of a makeover project done right! For another “oh wow” renovation, we recommend you check out: From boring to beautiful: a home you'll love. 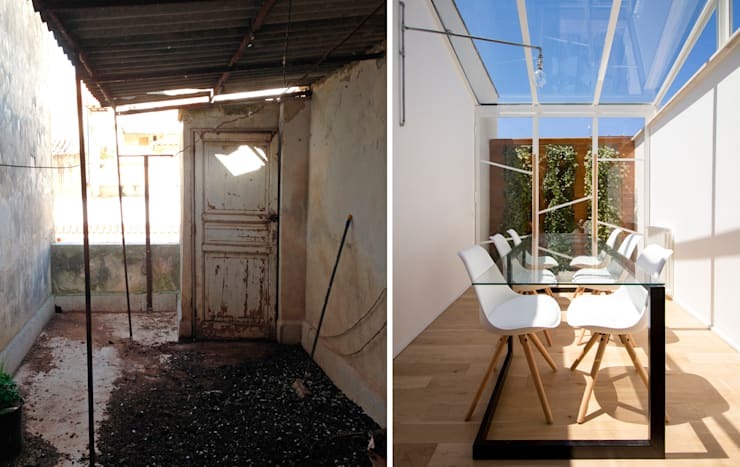 What do you think about this renovation project?